During his studies of Osteopathy, Gilles notices the extraordinary way of moving around the patient of one of his comrades. This colleague manages the narrow space around the table in a particular way. He is ONE with his patient. This colleague is an Aikido teacher. When he gets back to France in 1982, Gilles signs in an Aikido club in Cannes, under the direction of Malcolm Tiki Shewan and Daniel Leclerc. He also starts practising Iai and discovers Jodo in 1983. In 1985, regular Jodo training is held at the Aiki-club of Cannes. In 1986, a little group of passionates decide to create the Jodo Club de Cannes (today: Jodo Club de Côte-d'Azur). That very year, he meets Pascal Krieger at the annual gasshuku of Les Iles de Lérins. This meeting decides him to get more involved in Jodo. Since then, Gilles attended most of the Jodo Gasshuku Another meeting is going to have a big impact on his practice. It is when he met NISHIOKA Sensei in Hawaii in 1994. He discovers a "Great" little man with boundless generosity. 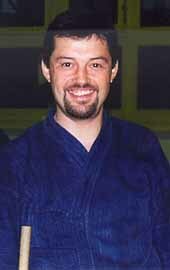 He received his Oku-Iri from Pascal Krieger in 1999 and is promoted Shoden at the Ohio Gasshuku in the USA in 2000. At the Kagamibiraki 2005, he received his Shomokuroku in Cartigny, Switzerland. At the Kagamibiraki 2013, he received his Gomokuroku and at the Stage des Iles 2018, he received Menkyo Kaiden from Pascal Krieger Sensei. He teaches in the south-est of France, where he did much to promote Jodo with Daniel Leclerc.